If we eat whole foods plant-based diet that is rich is legumes and nuts, alkalizing vegetables, complex carbohydrates, and healthy fats, then we can rest assured that we’re reaping far more benefits from our diet than someone on the Standard American Diet (SAD). However, there are a few missing nutrients in the vegan diet that I wish I had known about when I first started out. These nutrients may sound esoteric and random to a vegan newbie, but take it from me – you do not want to experience being deficient in them. In my journey to discovering the secrets for an optimal vegan diet, I’ve found that even nutritionists and doctors aren’t always clear on what supplements vegans actually need. Doctors are usually under-informed about nutrition (they barely teach any nutrition at all in med school), and both doctors and nutritionists can have a personal bias towards omnivore diets, thereby convoluting the matter. Although a well-rounded vegan diet does lack a few small but important elements, these by no means negate the amazing mental and physical benefits one gets by becoming vegan. Still, it’s important for vegans to know about these nutrients and take steps to ensure that they don’t develop any deficiencies. Our culture is woefully misinformed about protein. This is not through any fault of our own – it mainly has to do with advertising and lobbying by the meat and dairy industries since factory farming took off at the beginning of the 20th century. Still, the fact that people generally assume that meat, dairy, eggs, and fish are the only forms of protein does demonstrate how naive most people are about basic nutrition principles. Isn’t it remarkable that such basic, straightforward, and essential information was obscured from us? Our culture is totally preoccupied with protein, and yet in hospitals dealing with real medical issues, protein deficiency is not a thing. On the other hand, obesity, heart disease, and diabetes – which have been conclusively linked to animal products – are epidemic in our society. So now that we’ve cleared some of the misinformation surrounding protein, here’s what vegans do need to be mindful of: B12, vitamin D, and DHA and EPA. One of the biggest mistakes I made when I became vegan was that I didn’t realize I needed vitamin B12. All I knew was that after becoming vegan I was suddenly able to achieve my ideal weight without depriving myself, that I enjoyed vegan food more than omnivore food, and that my depression had mysteriously lifted. Because veganism seemed like the panacea to all of my problems, it didn’t occur to me that there might be any deficiencies in it. Even though my doctor (who is somewhat exceptional in that she does know a lot about nutrition) warned me that I had to take B12 and vitamin D, I thought they were just extras and that I didn’t really need them. About a year and a half into becoming vegan, I realized that something was wrong. I started to get tingling sensations in my hands and feet, and sometimes would wake up in the middle of the night with one of my hands seeming to be completely dead. It would take a minute of me desperately shaking it for my hand to return to normal. I also was feeling really drained and I could barely summon the energy to clean my apartment and get to and from work – let alone, find the energy to go to hot yoga, my favorite workout. After some internet research, I discovered that I had a B12 deficiency, which is inevitable for vegans who don’t take a supplement. 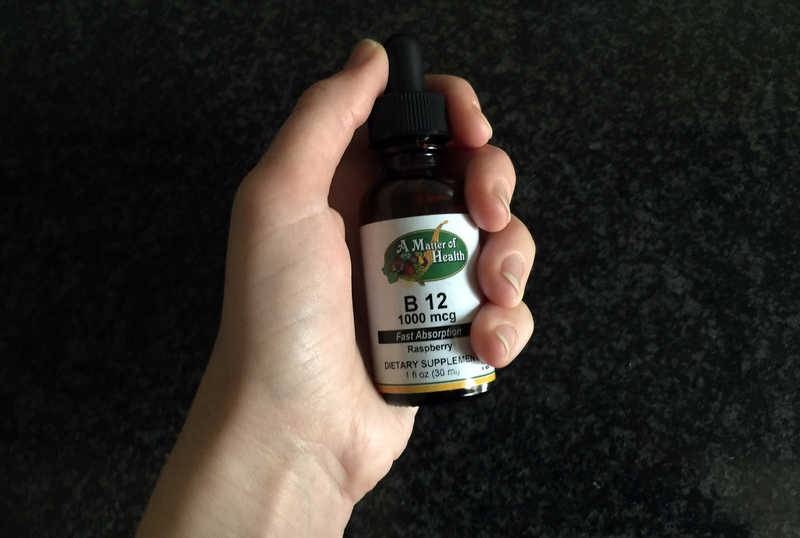 It took about two months of taking liquid B12 for my energy to come back full-force, and for the tingling to go away. I now take more than the recommended amount of B12 every day, which covers the necessary quota in addition to providing me with extra energy. B12 is needed for the regulation of the body’s nervous system and the production of DNA. It protects nerve and red blood cells and promotes circulation throughout the body. Since it’s a required nutrient for optimal brain function and energy production, deficits can lead to fatigue, anxiety, depression, difficulties concentrating, poor memory, and pins and needles in one’s hands and feet. While I can personally testify to the fact that B12 is absolutely necessary, I also know that it doesn’t make the vegan diet flawed. The only reason we can’t get B12 from a vegan diet is because it’s a nutrient found in the soil, and in our modern world, we wash and clean our vegetables. Since the best source of vitamin D is the sun, those of us living in the northern hemisphere can become susceptible to vitamin D deficiency in the winter months. Inadequate vitamin D intake is linked to many serious health issues including osteoporosis, cancer, and autoimmune diseases. Interesting fact: vitamin D isn’t actually a vitamin, but a hormone! Much like photosynthesis in plants, our bodies absorb sunlight through our skin and then convert it into vitamin D in our kidneys. Vitamin D is important for calcium absorption, cell growth, immune function, mood regulation, and warding off inflammation. Because only 10 minutes of sun exposure in the summer gives us 10,000 IU vitamin D, the FDA recommendation for vitamin D of 400 IU has been criticized by the Vitamin D Council for being way too low. The Vitamin D Council suggests that we instead aim for 5,000 IU vitamin D per day. The multivitamin I take – Dr. Fuhrman’s Women’s Daily Formula + D3 provides 2,000 IU, so I supplement that with 1 to 2 doses of Nordic Naturals Vegan Vitamin D3. During the spring and summer, I scale back on my vitamin D supplementation and instead expose my skin to the for about 15 minutes every day, wearing sunscreen the rest of the time I’m outside to avoid getting burned. When choosing a vegan vitamin D supplement, try to buy one with vitamin D3 instead of vitamin D2. Vitamin D3 has been found to be more effective than vitamin D2, and while all D3 supplements used to be derived from lanolin (which is not vegan), now vegan vitamin D3 derived from algae is available. Omega-3’s, which are important for brain and heart health, are easy to obtain through seeds like flax, chia, and hemp, in addition to seaweed. However, some doctors have raised concerns that these vegan omega-3 sources don’t contain DHA, which is important for preventing depression and other mental health issues. Udos Oil 3:6:9 DHA Blend contains the ideal ratio of 3:6:9 fatty acids from sunflower, flax, and sesame seeds as well as vegan DHA (sourced from sea algae). It goes great on rice and pasta leftovers, and adds a dynamic richness to smoothies. You can find it at Whole Foods and most health food stores. Another excellent form of DHA is E3Live, a form of blue-green algae found in Upper Klamath Lake in Oregon. Blue-green algae is considered by many to be the most nutritionally dense food on earth. It is rich in protein, essential fatty acids, chlorophyll, vitamins, and trace minerals. Benefits of consuming E3live include more energy and vitality, better focus, improved mood, and healthier skin. E3Live can be consumed as a shot by combining one teaspoon with water, or you can add it to smoothies and juices. Finally, Dr. Furhman has a formula called DHA + EPA Purity, which you can add to juices, tea, and other beverages. While vitamin B12, vitamin D, and omega-3’s with DHA are the most critical supplements for vegans to consume, a multivitamin is also good to have on hand to make sure you’re fully covered. Multivitamins have been under scrutiny for either providing certain vitamins / minerals that are dangerous to consume in supplement form, or their inability to be properly absorbed. And obviously, multivitamins are by no means a substitute for a healthy diet, where we should be getting most of our nutrients from. I’m a fan of Dr. Furhman’s Women’s Daily Formula + D3, which Dr. Furhman formulated to “fill in nutritional gaps in healthful diets,” such as vitamin B12, vitamin D, vitamin K2, iodine, zinc, and taurine without the ingredients that can be harmful in supplement form. It also contains his special blend of whole food, fruit, veggie and greens superfoods including extracts from açaí, kale leaf, broccoli sprouts and goji berries. Taurine is an amino acid that helps the body to assimilate nutrients, moderates cellular activity, and protects visual pathways. Our bodies naturally synthesize taurine from the foods we eat. However, very intense workouts may deplete our taurine levels, thereby outpacing our bodies’ ability to manufacture it. As someone who works out a fair amount, I have found supplementing with 1/4 tsp taurine powder (stirred into my tea in the morning) helps me to recover more easily and have more energy throughout the day. Probiotics help to replenish the healthy bacterial flora and kill off the unhealthy microorganisms in our gut. Having a good ratio of good to bad bacteria in our gut is not only important for digestion, but for warding off other ailments such as fatigue, depression, allergies, and constipation. Our gut also constitutes 80% of our immune system, so it’s essential that there is enough good bacteria to fight infection and disease. I usually drink a bottle of kombucha per day (my favorite brands are Health-Ade and Aqua ViTea) mainly just because of how refreshing and tasty it is, but it also serves as my probiotic. If you’re not a kombucha lover, other vegan sources of probiotics are miso and kimchi, but you may want to supplement with a probiotic supplement like GoodBelly. Supplements and multivitamins can definitely add up in terms of cost and they’re not particularly exciting things to splurge on. If you’re a vegan who is trying to economize and get away with the minimum supplementation necessary, know that the one supplement you absolutely can’t get away with not taking is B12, because eventually you will become deficient and potentially develop irreversible nerve damage. A B12 supplement is cheap so the expense should be a nonissue. The fact that we can’t get some nutrients such as B12 from vegan diet without taking a supplement does not by any means diminish the benefits of a vegan diet for our physical and mental health. Remember that a vegan diet decreases your risk for heart disease, obesity, and cancer, among other maladies, and also adds to your life expectancy. Finally, not only is a vegan diet beneficial to us, but it dramatically reduces our ecological footprint and conveys to the meat and dairy industry that we are not willing to be complicit in the abuse, mutilation, and slaughter of more than 150 billion animals per year. With B-12 (and even vitamin D) there are skin PATCHES you can purchase that deliver doses transdermally (where they absorb extremely well and do not end up in your urine like most pills). They are more pricey however. http://www.Therawfoodworld.com sells patches as do other people, but his are higher in B-12. I use them and feel they work well. Please note that our wonderful FDA has now called vitamin patches “drugs” and is taking them off the market (so stock up). On my website take a look at my “health resources” pages and you will see where my loyalty is.